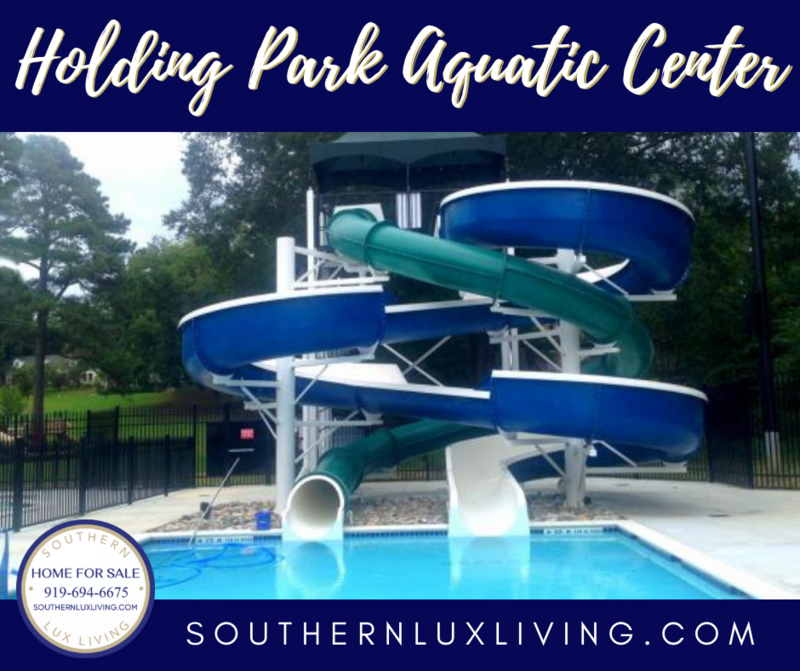 “Cannonball!” As summer approaches and pool season commences, residents of Wake Forest and neighboring communities will rejoice in hearing the many sounds of summer at Wake Forest’s new Holding Park Aquatic Center. The Memorial Day weekend opening is highly anticipated as the community has certainly missed having this summer past time in Wake Forest since it closed in 2016. The first Wake Forest pool & its companion Community House were originally opened in 1942. The initial request to build the pool came from Dr. Neville Isbell and was submitted to the Wake Forest mayor and its commissioners. The federal Works Progress Administration agreed to take on the project utilizing the labor of unemployed men that had lost jobs and income due to the Depression. At the time, the project cost the Town of Wake Forest $12,800 and the Works Progress Administration $67,117. Holding Park playground was NOT an original part of the plans, but was later built when the land was donated to the town. The pool and Community House were well-received and soon became a regular summer hang-out for many local families. However, as with anything, continual use and changes in technology/systems, upgrades are inevitable. So, after years of wear and tear and an abundance of annual visitors, Holding Park Pool underwent its first major renovation in 1978 when it was expanded to Olympic size. These improvements made a significant difference and were well-received. Unfortunately, more changes were necessary and the problems became too overwhelming when serious deficiencies were discovered in the lining of the pool while preparing for the 2016 season. The pool was closed immediately as the town and its commissioners weighed all options regarding the future of this historical and well-loved landmark. In November 2016, after much research and advice, they decided to construct a new pool at the same site. Yet another challenge was met when, in May 2017, crews realized that the deteriorating pump house could not accommodate the new equipment needed for the three pools. So it was further delayed and added an additional $200,000 to $250,000 to the estimated 2.5 million dollars that was previously approved. Finally, construction began in the fall of 2017. The hope was to open in May 2018; however, bad weather, extreme temperatures, and excessive rain created yet another hurdle and sadly, another summer passed by without the pool opening. A pool pass punch card (20 admissions) is available for $100 ($60 for residents) and a parent/toddler swim pass is available for $80 ($40 for residents).